Phil has an Honours Degree in Geography and a Master's Degree in Environmental Forestry from Bangor University in North Wales. Since qualifying, he has worked as a self-employed professional timber feller in woodlands across North Wales. He has gained a wealth of experience in the felling of large hardwood trees as well as softwood production felling including shortwood, pole length and skyline work, including the clearance of individual and multiple windblown trees. His years of experience in production forestry have developed his skills as a timber feller, making him an excellent chainsaw instructor. He is qualified in tree surgery work, namely tree climbing, performing aerial rescue and operating the chainsaw from a rope and harness. 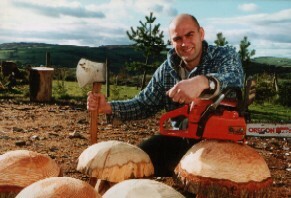 In 1999 and 2003, Phil was awarded the title of British Chainsaw Champion and has five times been awarded the title of Welsh Chainsaw Champion. He has twice represented the UK in the World Chainsaw Championships and was team captain in Italy in 2004. Phil is a member of the Gwynedd Axe Racing Team, which is another type of wood sport. The Gwynedd team and other teams across the country race to chop through blocks of wood with only an axe. They are often seen at country shows throughout the summer. Phil is a fully qualified and highly experienced LANTRA freelance chainsaw instructor, assessor and training provider. He has trained lots of people both in the UK and abroad including forestry workers, police, armed forces, emergency services, etc. Phil appeared on The BBC's Groundforce programme in March 2000 in which he carved items for a childrens home play area in Hackney, London. 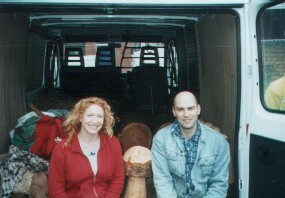 He has also appeared on several TV programmes on S4C doing various chainsaw carvings.